Unmanned marine system developer ASV Global is currently heading up a joint industry project (JIP) to investigate the feasibility of deploying unmanned vessels to serve the offshore wind farm support sector, with an emphasis on exploring the associated “technical, regulatory and societal issues”. Monikered the Windfarm Autonomous Ship Project (WASP), this JIP is being partly funded by Innovate UK and has been valued at £900,000 (US$1.2 million) overall. Alongside ASV Global, the WASP team currently includes: research centre Offshore Renewable Energy (ORE) Catapult; marine management services provider SeaRoc Group; naval architect and engineering specialist Houlder; and the University of Portsmouth. The participants will use SeaRoc’s SeaPlanner tool to remotely monitor the prototype robo-vessel and to develop advanced cargo planning systems, while the University of Portsmouth will be responsible for route planning, logistics management and systems analytics. 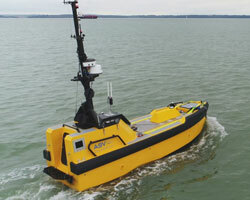 Houlder, meanwhile, is tasked with developing a suitable autonomous vessel design, complete with cargo-handling system. The WASP is set to run for a period of 18 months, and its participants hope to assess whether an unmanned vessel could reduce overall wind farm lifecycle costs – with ASV Global citing research that suggests that vessels can account for 60% of an offshore wind farm’s operating cost. Another potential benefit of the WASP is cross-sector pollination of new technology and skillsets. Simon Cheeseman, strategy manager at ORE Catapult, elaborates: “This is an excellent example of where we can deliver true cross-sector benefit, creating products that can be used across a number of maritime sectors, including offshore wind, search and rescue, oil and gas and border force. “Automotive, aerospace and defence are all embracing autonomous systems to carry out some of what we term the ‘five Ds’ – jobs which are dull, dangerous, dirty, distributed and dear.” He adds that, at this stage, the WASP is happy to consider potential new partners.